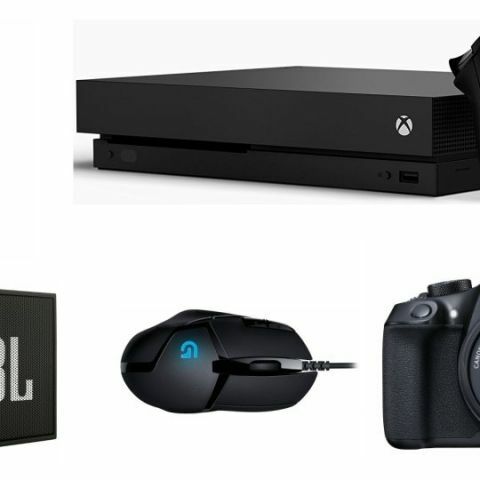 The Xbox One X is being offered at a discounted price, along with the Oppo F3 Plus, JBL Flip 4 speaker, Canon EOS 1300D DSLR and some other gadgets. For today's deals, we have found some great deals on portable speakers, gaming console, smartphones and more. The Logitech G402 wired mouse boasts of 20 Million Clicks and a 1 Millisecond response. You can buy it here. Amazon is offering the JBL GO Portable Wireless Bluetooth Speaker priced at Rs 1,699 after a discount of Rs 1,000. The company claims that it can deliver up to 5 hours of audio playback on a single charge. You can buy the Bluetooth speaker here. The JBL Flip 4 boasts of 12 hours audio playback on a single charge and comes equipped with a 3000mAh battery. It is also IPX7 water resistant and gives a power output of 16W. You can buy it here. The latest Microsoft Gaming console comes with an Xbox wireless controller and supports 4K gaming as well. It comes with a one year warranty and you can buy the gaming console here. The recently announced Vivo V9 smartphone will soon go up for sale starting April 2. Those who preorder it now will get Rs 1,000 off on it. The device features a 6.3-inch full HD+ screen with a 19:9 display aspect ratio and is powered by the Snapdragon 626 octa-core processor with 4GB RAM and 64GB internal storage. You can pre-order it here. The smartphone is powered by a Qualcomm Snapdragon 653 SoC with 6GB RAM and 64GB ROM. It features a 6-inch full HD display and is equipped with a 16MP rear and a 16+8MP dual front camera. You can buy the smartphone here. The Canon EOS 1300D comes with an 18-55mm ISII Lens and is an 18MP DSLR. Buyers will also get a free carry case with the device, and a 16GB SD card.It supports Wi-Fi, NFC and comes with 9-point AF with 1 center cross-type AF point. You can purchase it from here.